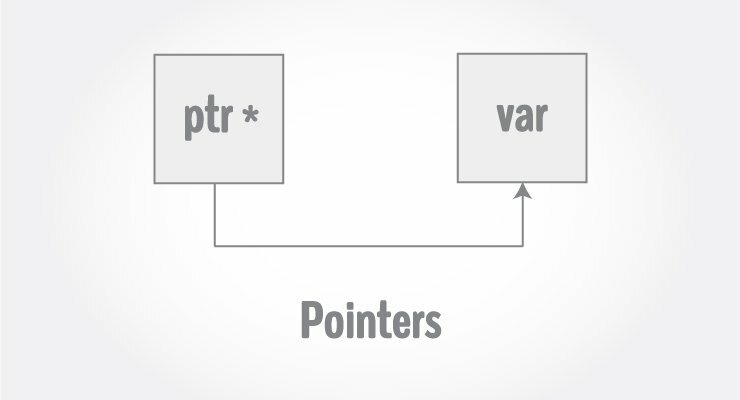 In this article, you'll learn everything about pointers. You'll learn how values are stored in the computer and how to access them using pointers. Pointers are powerful features of C++ that differentiates it from other programming languages like Java and Python. To understand pointers, you should first know how data is stored on the computer. Each variable you create in your program is assigned a location in the computer's memory. The value the variable stores is actually stored in the location assigned. To know where the data is stored, C++ has an & operator. The & (reference) operator gives you the address occupied by a variable. If var is a variable then, &var gives the address of that variable. Note: You may not get the same result on your system. The 0x in the beginning represents the address is in hexadecimal form. Notice that first address differs from second by 4-bytes and second address differs from third by 4-bytes. This is because the size of integer (variable of type int) is 4 bytes in 64-bit system. C++ gives you the power to manipulate the data in the computer's memory directly. You can assign and de-assign any space in the memory as you wish. This is done using Pointer variables. Pointers variables are variables that points to a specific address in the memory pointed by another variable. How to declare a pointer? The asterisk is a dereference operator which means pointer to. Here, pointer p is a pointer to int, i.e., it is pointing to an integer value in the memory address. Reference operator (&) as discussed above gives the address of a variable. To get the value stored in the memory address, we use the dereference operator (*). For example: If a number variable is stored in the memory address 0x123, and it contains a value 5. The reference (&) operator gives the value 0x123, while the dereference (*) operator gives the value 5. Note: The (*) sign used in the declaration of C++ pointer is not the dereference pointer. It is just a similar notation that creates a pointer. C++ Program to demonstrate the working of pointer. c = 11;    // The content inside memory address &c is changed from 5 to 11. When c = 5; the value 5 is stored in the address of variable c - 0x7fff5fbff8c. When pc = &c; the pointer pc holds the address of c - 0x7fff5fbff8c, and the expression (dereference operator) *pc outputs the value stored in that address, 5. 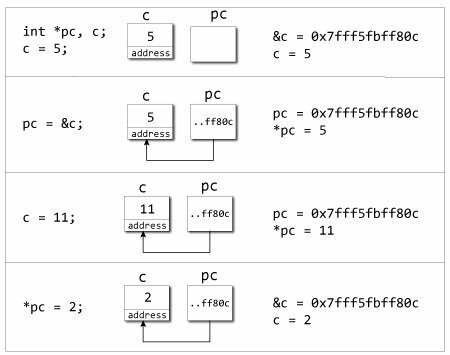 When c = 11; since the address pointer pc holds is the same as c - 0x7fff5fbff8c, change in the value of c is also reflected when the expression *pc is executed, which now outputs 11. When *pc = 2; it changes the content of the address stored by pc - 0x7fff5fbff8c. This is changed from 11 to 2. So, when we print the value of c, the value is 2 as well. In both cases, pointer pc is not pointing to the address of c.
How to use generic data type pointer using void pointer? How to represent array using pointer? How to use pointers with functions? How to use pointers with structures?